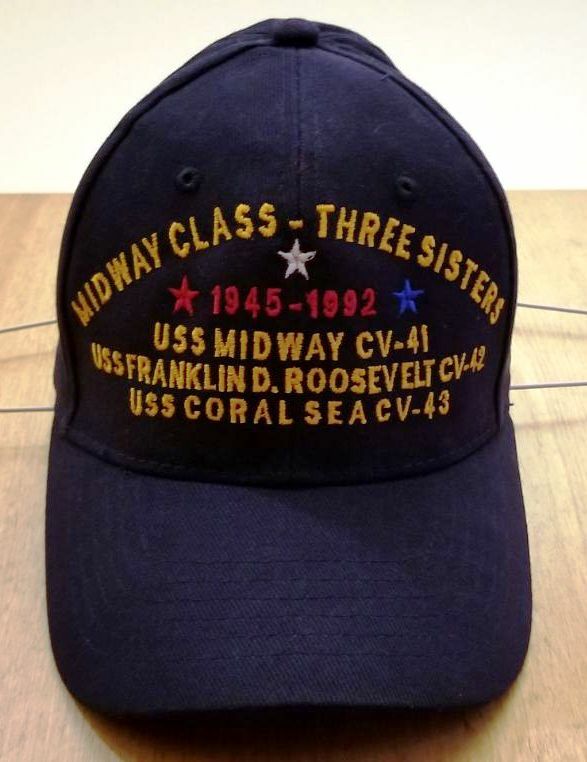 As I think all of you are aware, the USS FDR Reunion will participate in the Midway Class Reunion AKA "Three Sisters Reunion" to be held next May 7-10 in San Diego. 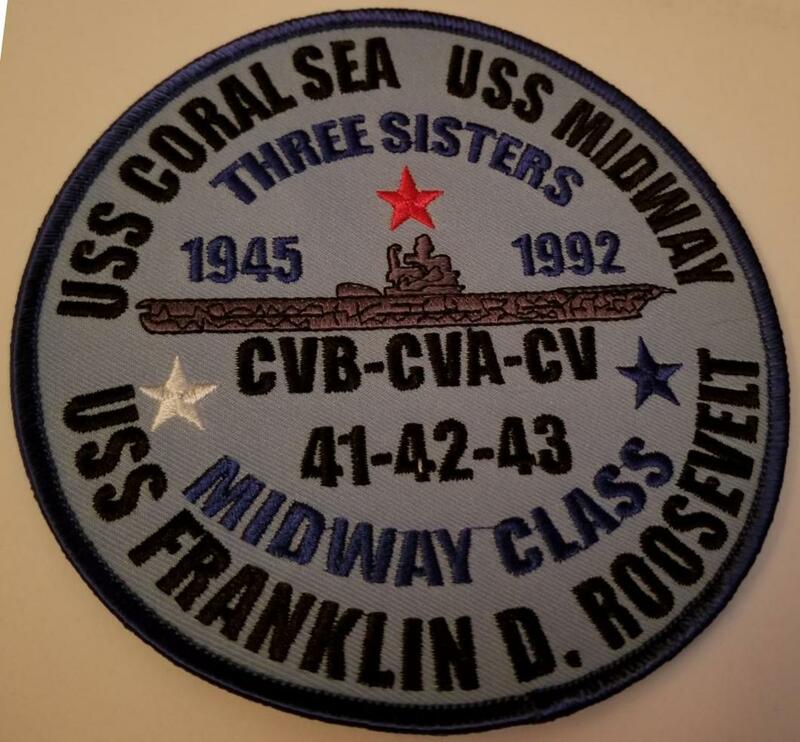 Shipmates from all three Midway Class ships will gather with the main event being a joint banquet on the Midway Flight Deck Thursday evening. I wanted you to be aware of some items that are being made available through the Coral Sea Veterans Association. Their President, Wayne Addkinson, has designed a jacket, hat and patch to commemorate this once in a lifetime event. The photos Wayne sent me appear at the bottom of this page. 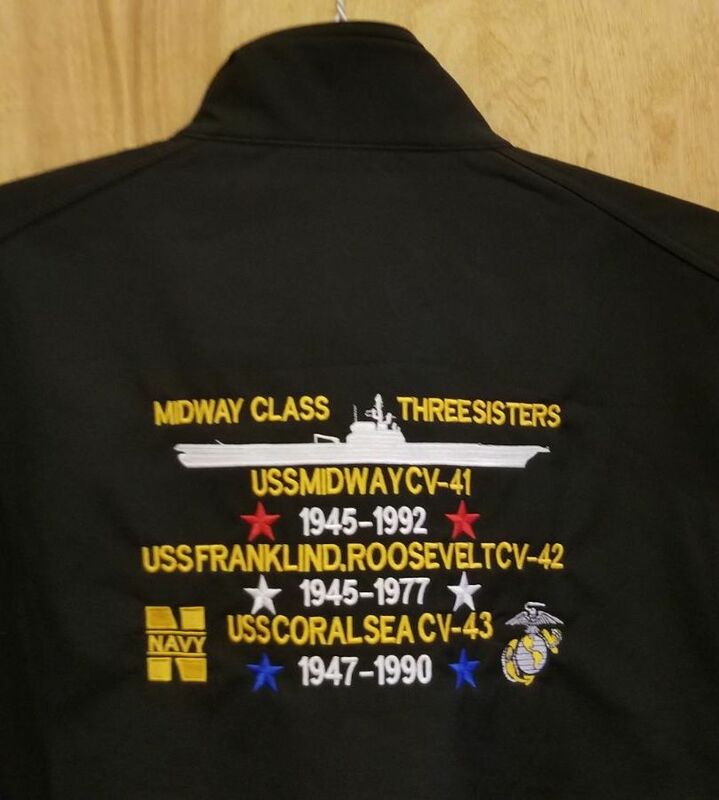 Those interested in the FDR jacket; please check the photo of the embroidery and take note of of how "FranklinD.Roosevelt" is not spaced. This is not to discourage you from purchasing but some find they don't care for the way it appears. 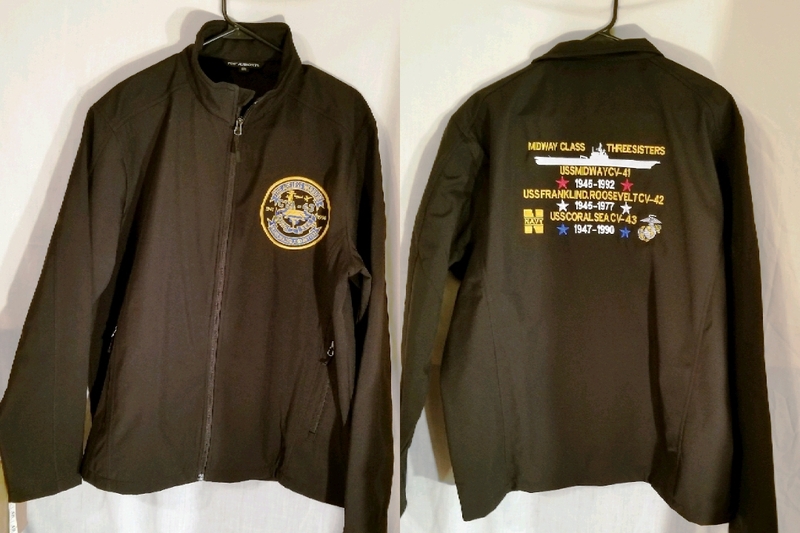 The Jacket, Patch, and Hat are a package and can be bought for $175.95, shipped anywhere in the US. An FDR patch will be on the left side front. If you want the Three Sisters Patch sewn on the right side, that will be done at no additional cost. If you prefer to get the Three Sisters patch loose, Wayne says they'll just put it in the jacket pocket. Call Wayne at 903 288 4455 to place an order or with any questions. If you want to pay with any other method, call Wayne in advance and make sure that's something he'll deal with. THESE JACKETS WILL NOT BE AVAILABLE FOR PURCHASE AT THE REUNION! THEY ARE ONLY BY ADVANCED PURCHASE! You do not have to be going to the reunion to order this jacket! I'm reaching out to every FDR Shipmate for whom I have an email. If you get this email more than once, my apologies! BTW: Hotel rooms are going fast. The "Reunion Rate" will only be honored until the block of rooms we initially negotiated is filled. If you are planning on going, act now if you want the reunion rate. If you miss out, there are many options nearby the Wyndham, but that will be up to you to arrange.